One’s 20s are often romanticized as being a time of adventure and self-discovery. But this doesn’t come without its downsides, and Hinds understands this duality. The two frontwomen, Carlotta Cosials and Ana Perrote, started Hinds as a duo in 2011 before later joining forces with Ade Martin and Amber Grimbergen in 2014 to form the forceful indie-rock quartet in Madrid, Spain. In just a short amount of time, Hinds has honed in on their sound and picked up quite a following while doing so. Their sophomore album, I Don’t Run, brings an unpolished intensity that popularized American indie-rock is often missing. Matching their honest, garage-rock sound, the lyrics featured in the album are equally authentic and exemplify the confused nature of youth, specifically the challenges of modern love. 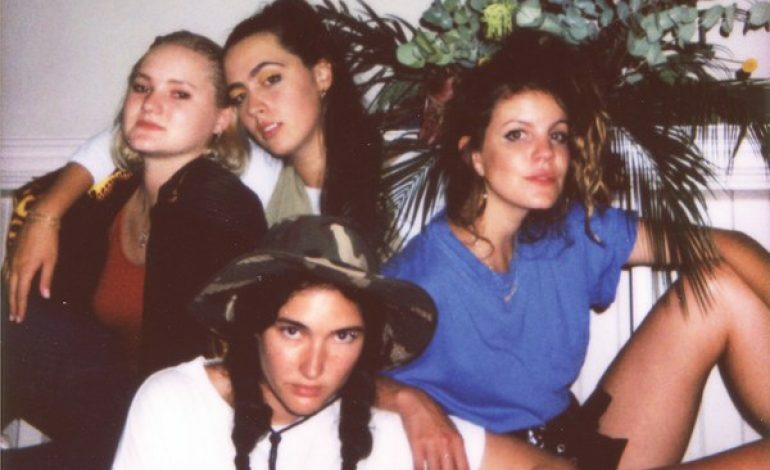 Hinds stands out by having two starring vocalists, Cosials and Perrote. Their vocals intertwine and dance around each other so seamlessly while still offering distinctly different atmospheres. While Perrote’s voice is soothing and warm, Cosials sings with charming angst. The two contrast so beautifully and no track would sound as good with just one or the other. Even when singing the same exact line, it sounds entirely different, thus challenging the listener to think about a single experience from diverging perspectives. Perrote’s “We are just having fun” in “Tester” sounds like a memory of a feeling, while Cosials’ “We are just having fun” is a sassy tease. Whether they’re harmonizing on the same line, finishing each other’s sentences or switching off between verses, this duo is greater than the sum of its parts. Through most of I Don’t Run, the girls sing of love, but not lovingly. “The Club” is perhaps the most quintessential Hinds track on the album, making it the perfect track to kick off I Don’t Run. The song demands attention from the start with drums and upbeat electric guitar that have hints of a ‘90s pop-rock influence. Cosials’ and Perrote’s lo-fi vocals jump in as they coyly chant “No, I’m friendly saying no / Last night was wrong, I know / You don’t need a lover / But I don’t want to go.” “Soberland” has an unapologetic roughness to it as Cosials’ and Perrote’s vocals are tough and full of anger and emotion as they mockingly shout “I hate your taste, I hate your background… Now you’re Mr. Soon in your bed of cliches.” However, not all of their songs about love are accusatory. “New For You” flips the script as the girls criticize themselves, singing of reinventing their own character for the sake of love. “Tester” is a stand-out track full of craziness and eccentricity. It starts with a gentle, acoustic intro with the first line being, “I’m down on my knees / Begging you please,” eventually escalating to “I don’t know what I saw in you.” Then the first verse hits with heavy, pounding drum. With lyrics like, “You can prove me wrong / but when I’m alone, I feel like I’m your tester” and “Why did you have to lie to my face? / Should I have known you were also banging her,” the girls sing of being Plan B on a lover’s list of lovers. Rather than making this a sad song like one would expect from a song of this topic, the girls play it up with wild, thrashing instrumentals and teasing vocals. “Linda” shows off a softer and more vulnerable side to Hinds. The girls sing of watching love deteriorate and feeling lost because of it. The gentle tune sounds almost fun and beachy until the honest lyrics register. “My veneration set you free / You’re kind of pushing me the other way / I need you please / My baby, please.” After they lyrics set in, the instrumentals sound hauntingly nostalgic. Another calmer song, “I Feel Cold But I Feel More,” tracks the inevitability of moving on to a new chapter in life. The girls muse “I’m okay even if I’m lonely / But babe, I’m done” to an equally bittersweet tune. The final track, “Ma Nuit,” steers away from the topic of love and commemorates the girls’ feelings while being on the road. Perrote sings “Well, you know, if I was home right now / I wouldn’t feel like asking questions to the road / I would be home,” explaining the difficulty of always touring and missing the sense of belonging somewhere. The song was born from a riff Cosials often played during soundchecks while on tour. One night, Perrote organically began singing and strumming along, and the two decided to make note of the session with a voice recording, thus creating the intense lo-fi sound. Cosials sings in Spanish while Perrote sings in English and adds one verse of French near the end. The result is a soft, genuine and haunting masterpiece. The girls felt the authenticity of the voice recording was unmatched and couldn’t be recreated, so this single take officially made it on the album as the closing track. The tracks on I Don’t Run range from aggressive to gentle, similar to the ups and downs of one’s 20s. The girls are not trying to seem more mature or polished than they naturally are. Instead, they are celebrating their youth and everything that comes with it. Hinds is nothing but real with the lyrics and music they put together in the album, and the end result is an album that is as beautifully messy as the era in life it represents.